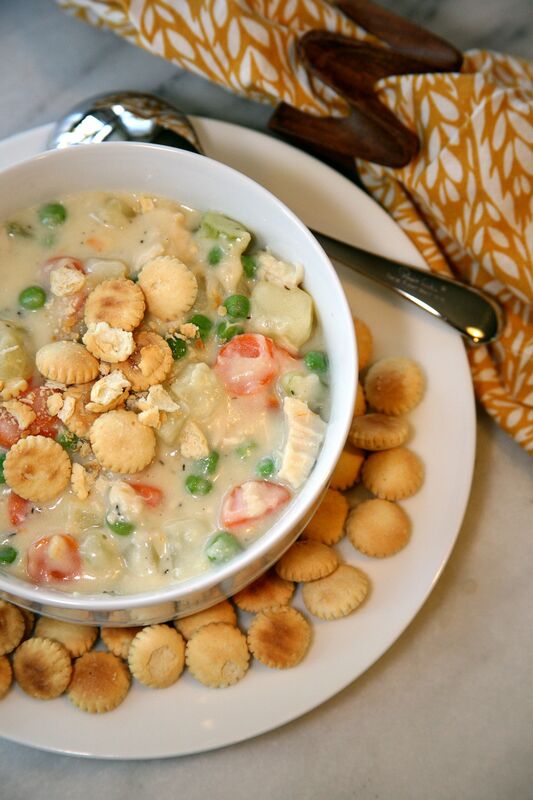 Chicken pot pie soup is a perfect comfort meal and a quicker version of the traditional dish. Traditional chicken pot pie is delicious, but can take some time in the kitchen. The soup is easy enough to make on weeknights when that so called spare time is limited! I topped our bowls with oyster crackers and made salads for a side. Rolls, multi-grain flatbread or saltine crackers would compliment the soup well too! My hometown is near Amish Country where you can find delectable homemade dinner rolls we consistently have at our holiday family gatherings. I may have to bring some home from Thanksgiving this year along with leftover turkey, because I have a feeling those rolls dipped in a turkey pot pie soup would be delightful. And now that I’m craving Thanksgiving dinner in addition to this soup I’ll leave you with the recipe so we can all get to the kitchen! 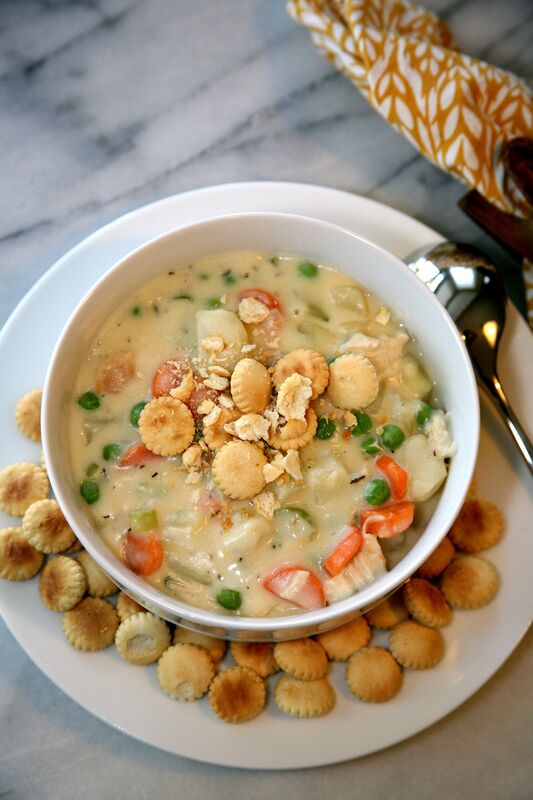 If you’ve got rain in your forecast these next few days also, I hope this warming recipe will be perfect as you curl up and enjoy a relaxing evening! In a large pot over medium heat, melt butter. Add flour and stir continuously for about 1 minute. Gradually add milk, stirring well until smooth. Once all the milk is added, pour in chicken broth. Add diced potatoes, carrots and thyme and bring soup to a brief boil. Reduce heat and simmer until potatoes and carrots are tender. Add frozen peas and cooked chicken. Cook over low heat for an additional 10-15 minutes to cook peas and warm chicken. Stir occasionally and add salt and pepper (or additional thyme) as needed for taste. Serve hot topped with your choice of garnish. This looks amazing! I just posted a new recipe that I think you’d enjoy. Comfort food lovers unite! Thank you!! I love your post about sushi as a comfort food, so good!